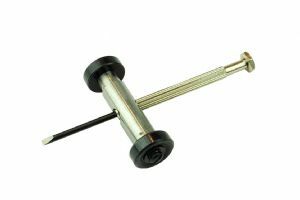 Adjustable spring action tool is used to hold watchmakers screwdrivers at the correct angle and the two wheels at either end allow easy rolling along the surface of a sharpening stone abrasive or polishing paper like emery paper. Overall size - approx 45mm long x 15mm diameter. Will hold screwdrivers up to 5mm in diameter . Please have a look in our shop for other hard to find tools at hard to beat prices.